You are here: Home / Travel / Taking the bus to Disneyland?! This post is sponsored by OC Transit Authority and OCBus. All opinions are 100% my own. One of the most awesome benefits of living in Southern California is that we are so close to Orange County and all the amenities it has to offer, from beaches to the Disneyland Resort and more. But if you've ever been to OC, you might have experienced it's infamous traffic. We live about 60 miles from Disneyland. 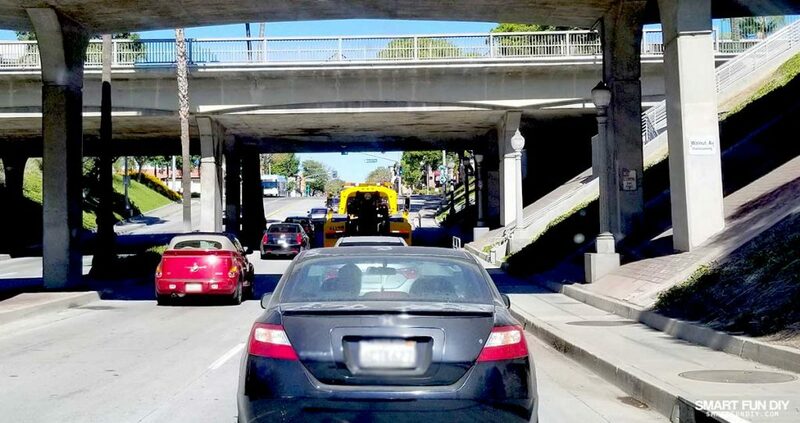 However like a lot of Southern Californians who are Disneyland Resort Annual Passholders, the number one reason that we don't go to Disneyland and the Anaheim area more often is because of traffic. So when the OC Bus asked me if I would try out riding the bus, I thought what do I have to lose? Sitting in traffic on the 57? Sign me up! I'll be honest, I was a little bit skeptical about riding the bus to Disneyland and about how the process would be. 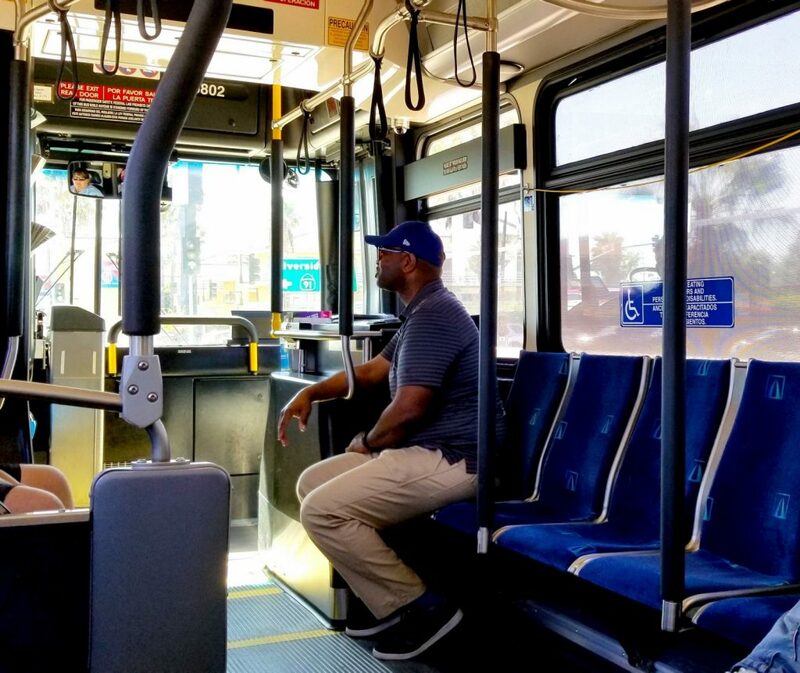 Keep reading to see the surprising benefits of riding the bus around the OC and why we may never drive our own car in the OC again! Normally, when we are going to Disneyland, we have to wait in a long line of cars and then pay $20 to park. I absolutely love Disneyland and all things Disney however the parking situation has been a real challenge as someone who is disabled. I'm always worried about whether or not I'm going to be able to get back to my car without being in too much pain because I've had to park too far away or stand in too many lines between leaving the Park and getting to my car. 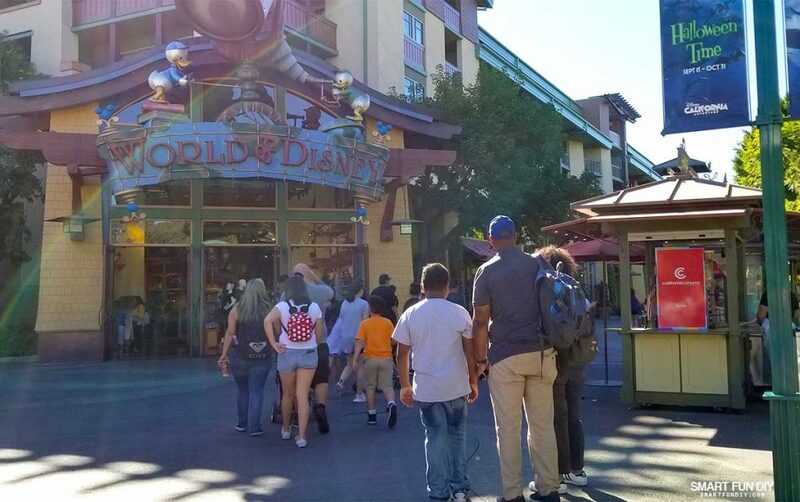 If you have kids with strollers or any kind of situation that complicates parking, then you probably have had similar experiences parking at the Disneyland Resort, Anaheim Convention Center, or Downtown Disney. Parking is expensive, not easy to find, and lots are far from your destination. But there is an alternative to all of this hassle, one I never even thought about until now … solve the parking problem by riding the OC Bus! As new riders on OC Bus we were able to get free 2-day passes. 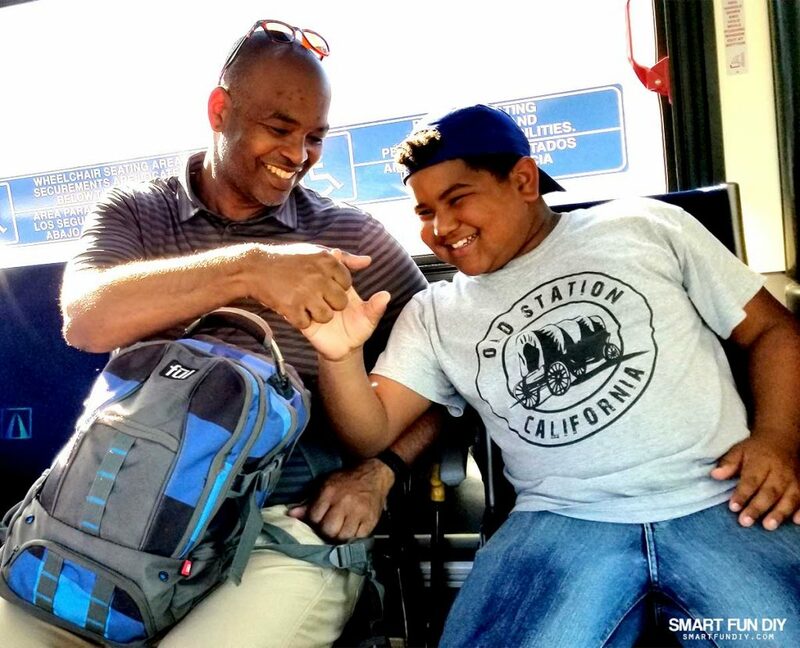 This free 2-day pass offer from OC Bus is open to everybody! And if you're an existing OC Bus pass holder you can enter to win a free 30-day bus pass. It's a pretty sweet deal. If I was just visiting the Disneyland Resort or the Anaheim area from out of town, I would snag one of those free bus passes right away and ride everywhere on the bus. You can literally see everything you need to see and go all over the place in OC with the OC Bus pass. As a So Cal local, I never really think about using public transportation. If you grew up here, then you might have had the same experience with driving your own car everywhere. 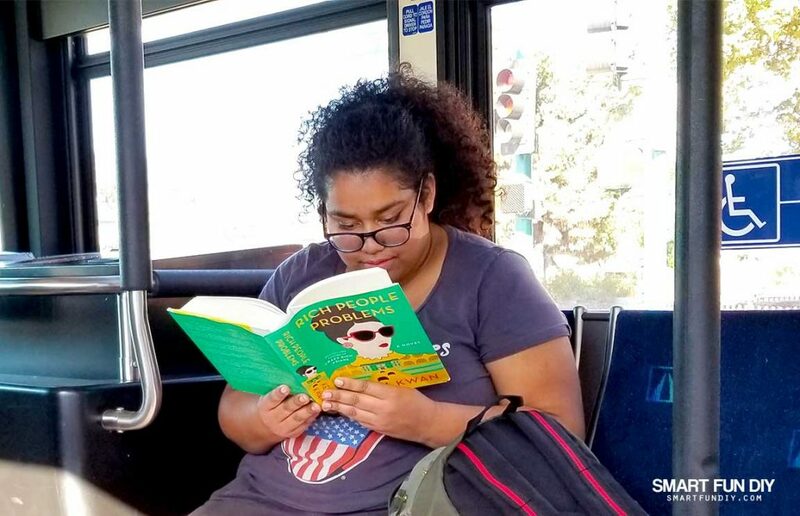 With all of the improvements the OC Bus has made to public transportation in the OC, I feel like I've been missing out on the secret to skipping the traffic all these years. 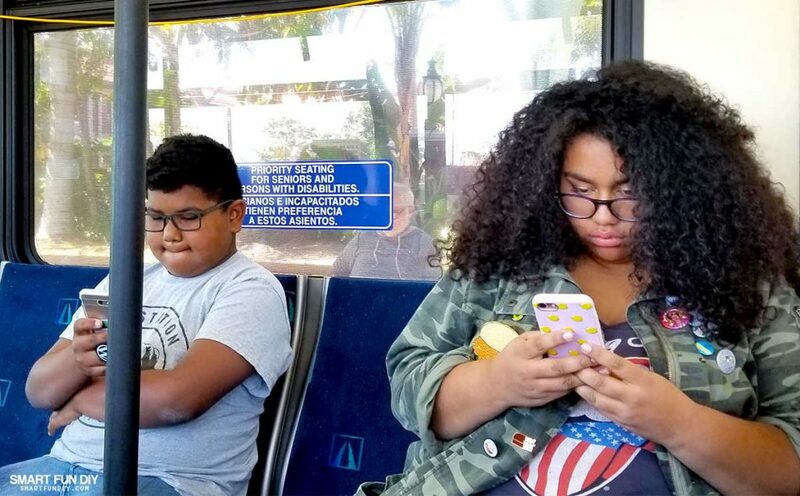 If you're tired of traffic during your commute or on the weekends when you're out with the fam, then you're gonna want to keep reading to see what riding OC Bus is really like! And P.S. 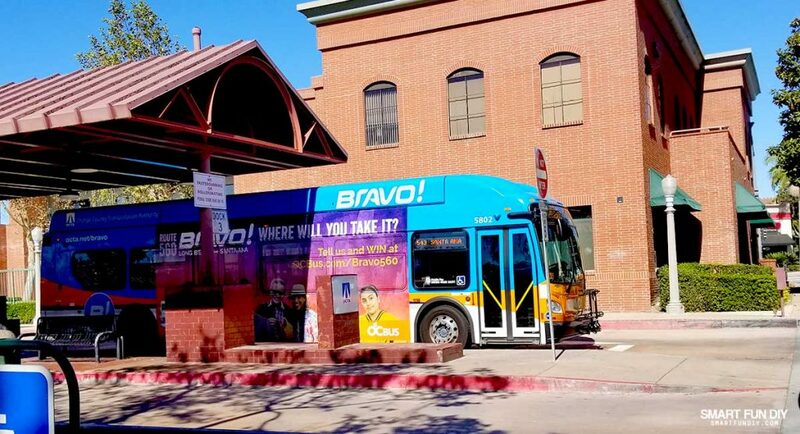 you don't have to live in the OC to take the OCbus. We started off our bus ride at the Fullerton Transportation Center. This is a stop for multiple buses in the OC Bus system on the north end of Orange County. Since we live northeast of the OC, this was the perfect place for us to connect with the OC Bus. There is a public parking garage across the street from the Fullerton Transportation Center as well as a lot with shade trees right next to the bus stop. We pulled up, found a spot right in the shade super quickly, and stepped right onto the bus. We could park here and then continue deeper into the OC on the OCBus, avoiding all of the traffic. When we got onto the bus, it was clean and air-conditioned. As you enter, there is a slot to slide your bus pass through. A friendly driver will greet you and then you can find a seat. 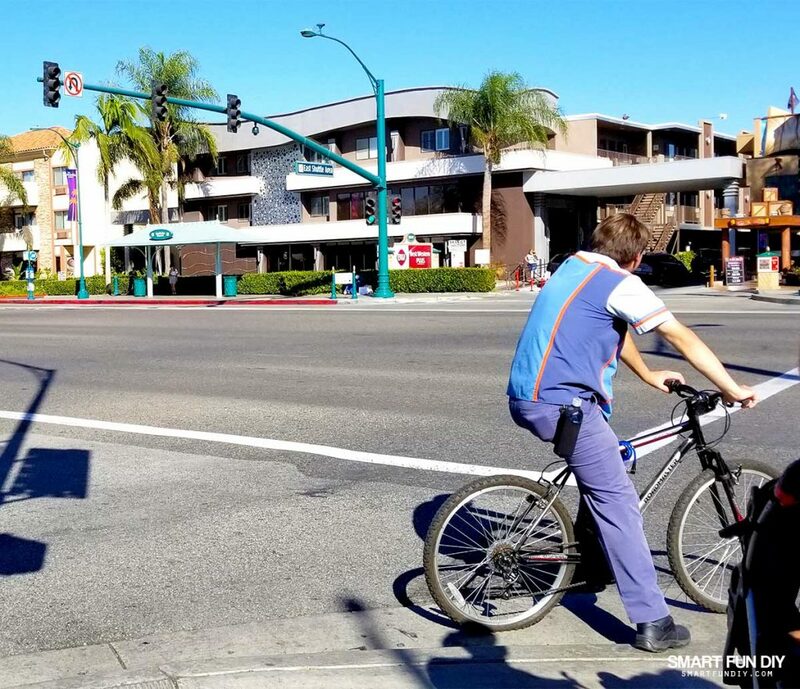 Within just a few minutes of parking, we were zipping along Harbor Blvd in comfort on the 543 express bus towards the heart of Anaheim. The bus driver was super friendly and she told us lots of tips about riding the bus. I think my husband found a new friend … LOL! She told us at the 543 bus that we were on has fewer stops because it's meant to be an Express Bus to help you get across town quickly. If we wanted to have more stops along the way, we could catch the 43 bus along the same route to stop more frequently. This was some really great info because it allowed us to choose the right bus to board on our way back to the car. We use apps to see how the long wait is at our favorite Disneyland Resort rides. By riding the bus, we could check the apps before we got to the Park! Or play games … I actually think the kids were playing games on their phones and not checking the wait times like I asked them to … kids! I know it sounds a little sappy but we actually were a lot more relaxed riding the OC Bus to the Park than we would have been driving 100% of the way. We could play games, talk, and even read books if we wanted. As the “driver” in my family, I really appreciated this time I could have face-to-face with the kids and my husband rather than worrying about traffic or finding a parking spot. Within about 15 minutes from boarding the bus we had made it from Fullerton down to the front drive of the Disneyland Resort. The bus stops right there and let you off right on the corner of Harbor Boulevard and the Disneyland Resort entrance. From here, you can access all of the restaurants along Harbor Blvd or enter the Disneyland Resort area. A quick walk from Harbor Blvd to the Disneyland Resort entrance plaza and we were through security in no time. In fact the security lines on this side of the Disneyland Resort we're very short. I don't know if I'm ever going to park in the parking structure again to be honest! After getting through security we walked right up to the entrance of Disneyland and were in the gates lickety-split. We had a great time at the Disneyland Resort grabbing lunch and doing a little bit of shopping. 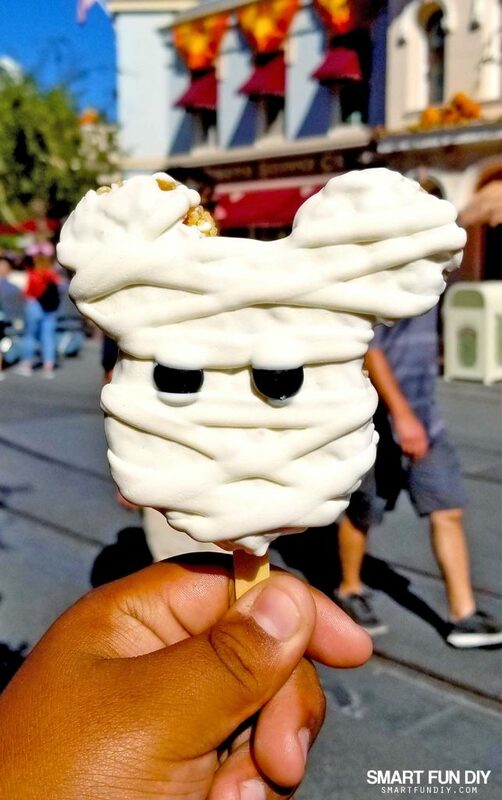 Disneyland Resort is decked to the nines for Halloweentime, with a giant Mickey Jack-o-Lantern in the center of the town square at Main Street USA and candy corn colored decorations everywhere you turn. Grab a Mickey Mouse Rice Krispie treat as a snack and walk around taking in the sights. There's always the rides to go on as well. After eating lunch at Disneyland Resort, we decided to head over to Downtown Disney. Downtown Disney is on the opposite side of the Disneyland Resort entrance Plaza from the bus stop. We walked around a little bit and then decided to head back to the bus stop. 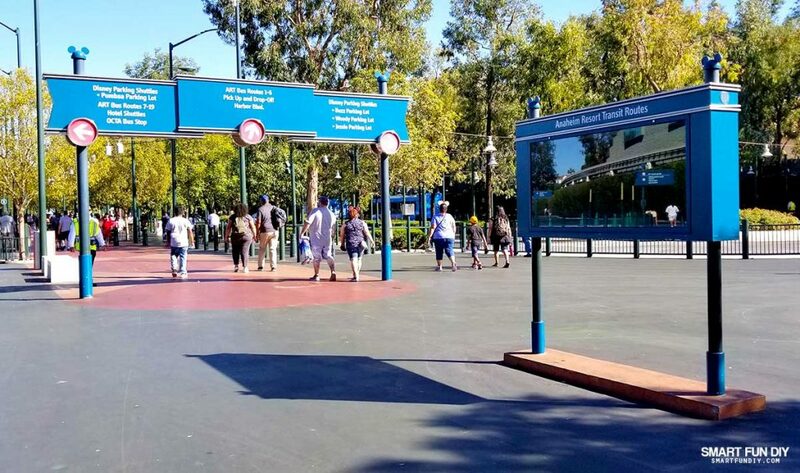 In case you get turned around, the Disneyland Resort has lots of great signage to help you connect with the right transportation option for you. To catch the 543 of us heading back North to Fullerton, we had to cross Harbor Boulevard to the east side of the street. See the shaded bus stop on the left in the photo above? We literally waited only three minutes for the bus to pull up and pick us up. Again, the bus driver was super friendly and welcomed us onto the bus alongside all of the Disney cast members who were getting off of work from Disneyland Resort and some other tourists who were taking advantage of the bus the OC bus 2-day pass. Riding on the bus my daughter decided to read her book well my husband and I and our son chatted in the comfy, clean, air-conditioned bus. These the buses are not what I think of when I think of riding the bus; they're clean, they're updated and new, and they're comfortable. 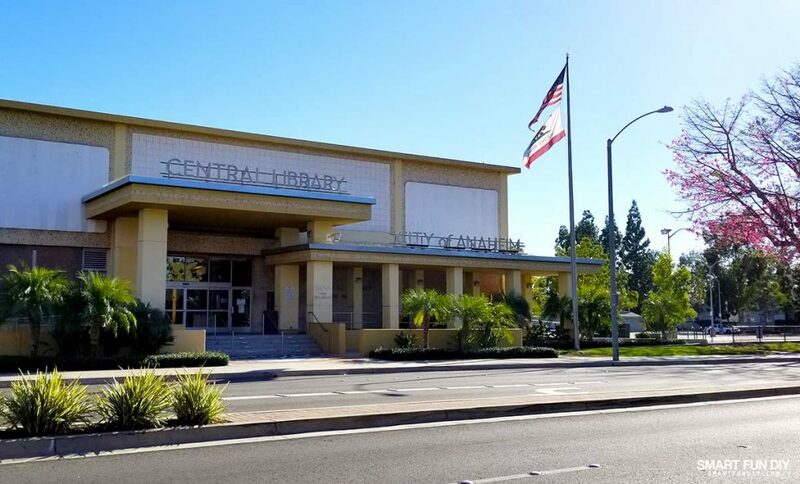 We decided to get off of the bus and check out the Anaheim City Library, which is a gorgeous building on the north side of Anaheim. From there we got back on the bus and got off at the next stop and went to the Anaheim Packing House for dinner. 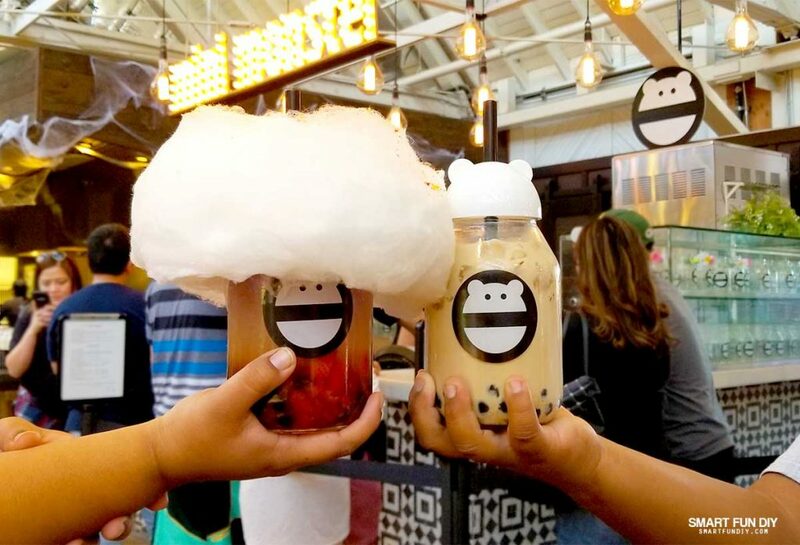 The kids got these crazy freak drinks from Mini Monster, a new stand inside the Packing House, and Xaver got ramen from Orange Tei. After getting dinner and relaxing for a few minutes we walked back to the bus stop and caught the 543 back to the car. We didn't have to worry about finding a place to park at the packing house, which is literally packed and I'm not making a joke. 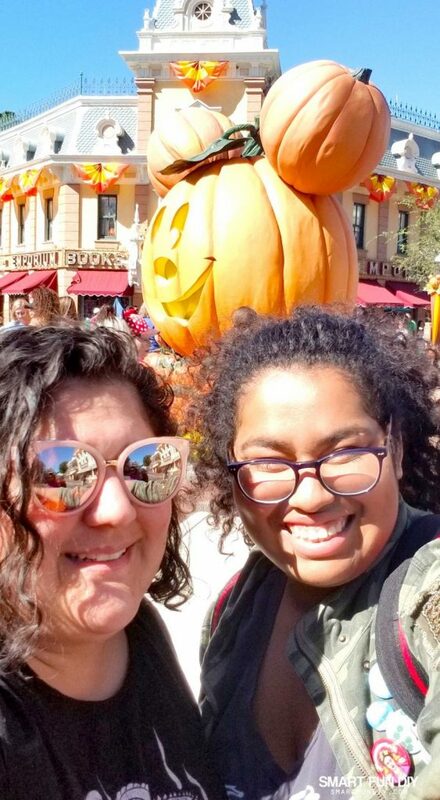 We saved money because we didn't have to pay for parking or valet parking at Disneyland Resort or the Anaheim Packing House. And when we got back to our car it was safe and cool in the shade of the Fullerton Transportation Center. With improved service and frequency, the OC Bus makes getting around town super easy without walking too far. One of the most stressful things about driving in Orange County for me is the traffic. You can't relax because you have to be watching to make sure that someone's not slamming on their brakes or cutting you off. It was so nice to be able to relax, chit chat, and hang out with my family while we were being driven to and from the Disneyland Resort. We all know that buses are smart alternative to commuting. Since I don't actually commute to work because I literally work in my house, this isn't something that I think about very often. But having had this experience where we took the bus on a fun weekend outing with the family, I'm going to look at taking the bus really differently. You don't have to be commuting to work in order to use public transportation. 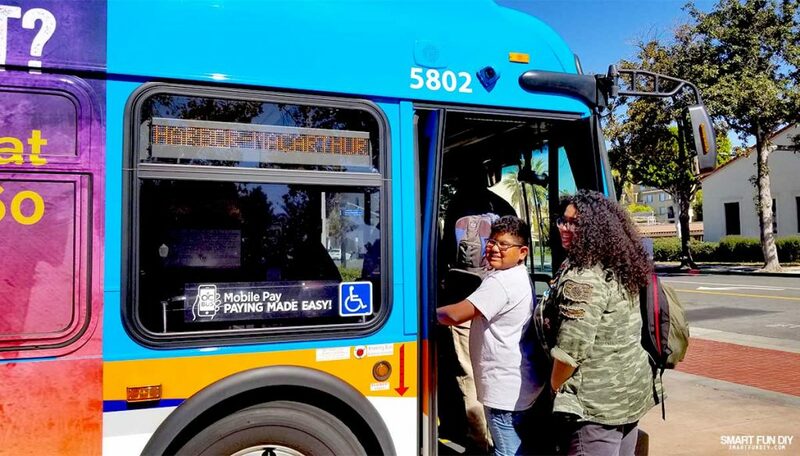 And the OC Transit Authority has set up the OC Bus in a way that makes it convenient and comfortable to visit all of OC's best attractions like the Great Wolf Lodge and Disneyland Resort. If you don't live in Orange County, you can find free public parking in lots of cities along all of the bus routes. From there you can take the bus wherever you need to go across the entire County. You'll not only save time and reduce stress but you'll also save money because you're not going to be spending money on gas while idling in traffic or having to make repairs from fender benders that happen on congested streets. 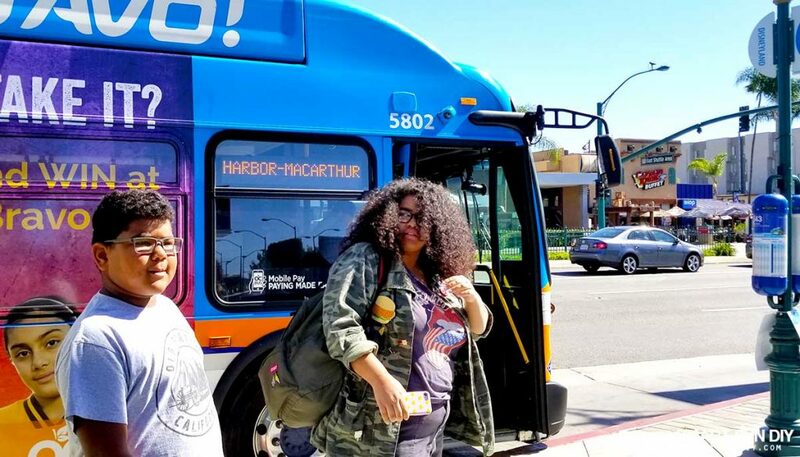 The OC Bus in Orange County truly is an alternative to cars no matter if you're going to work or if you're hanging out in Orange County for fun. Plan your commute and route now at OC bus.com. Don't forget to grab your free 2 day pass! Do you have a public transportation or tip for visiting the Disneyland Resort? Let us know in the comments below! 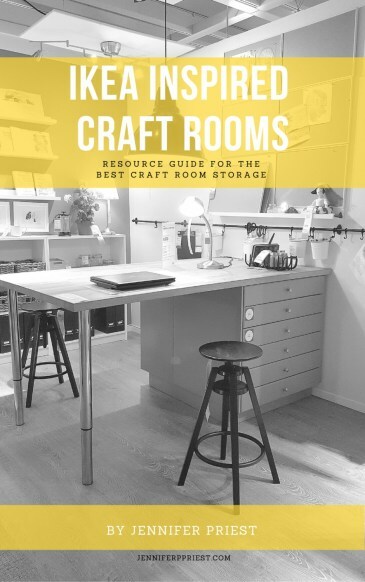 Great tips and info! Looks like taking the bus makes it so easy to visit!! So glad you had fun! Oh man, how convenient is that?! I had no idea there was a bus that would take you there. Disneyland is on our list of places to visit and I’ll definitely look into going the bus route! Thanks for the info! That’s such a great idea to take the bus. Thanks for all of the tips.